One of the main GPR parameters is the depth of detected objects. The maximum depth of the object detection is defined by the signal/noise ratio. In other words, the GPR that has the wider dynamical range will have the bigger depth of the object detection. For pulse GPRs the most effective way to widen a dynamical range is 'stacking'. The increase of stacking number leads to an increase of signal/noise ratio but at the same time the increase of stacking number leads to the sounding speed decrease. 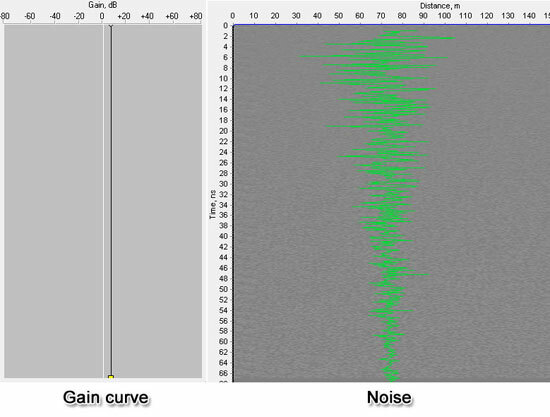 The picture above shows how a noise effective value changes along with stocking number change. Transient Technologies LLC introduces its the latest engineering development - Telbin technology. This technology allows to apply a considerable stacking number and to keep the high speed of sounding at the same time. 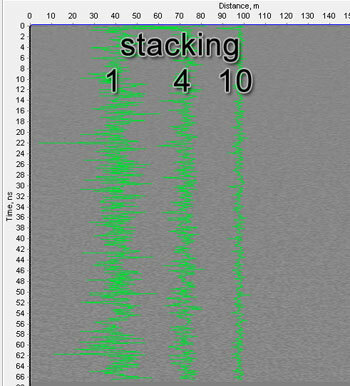 On the picture above you can see an influence of stacking number on the effective noise value. But to compensate the valid signal decreasing in GPR data processing you should apply an uneven gain. In VIY GPRs using the Telbin technology and applying an even gain, the noise decreases with sounding depth increasing. Therefore, applying an uneven gain to that GPR profile, the effective amplitude of the noise will become even. Using the Telbin technology you can increase signal/noise ratio substantially and so the sounding depth will be enlarged. Along with it the sounding speed (number of traces per second) will keep high. Please find here more information about VIY3 software. You can update your GPR's firmware and add Telbin technology to your GPR as well. Please contact your regional Transient Technologies office.